Don't you hate when this happens to you. 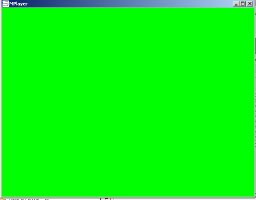 You get a video from a DVR and try to play it back on your computer, and all you see is a solid colour screen. Or ... you see the video but your screen grabber's output is just the solid colour. Don't you wish that there was an easy alternative? There is ... and you don't have to spend a lot of money to get it. In fact, this software is FREE. Introducing SUPER ©. SUPER © is a handy little utility that I think you'll come to love. You'll soon find yourself wondering what you ever did without it. Here's one thing it does really well - pull all the frames out of a digital video in just a few simple steps. Just select Sequence of Images as your output from the first pull down menu. It's way at the bottom of the list. Now, I know what you're thinking ... and yes, it does import and export all of those file formats. Pretty cool. But in this case, we just want some still frames, so we drop our file into the bin, activate it, and click Encode. The resulting files are generated fast. I certainly like the look of this file, vs. the green block above. You can use it like VirtualDub - but I think its a bit more flexible when it comes to output options. Since it's free, you can have both. We posted a new build of Premiere Pro English web Help and the Premiere Pro Help PDF yesterday. [The document is officially named Using Adobe Premiere Pro CS4, but I just can't bring myself to stop calling it simply Help.] The new build contains a number of new topics, and corrections to some legacy topics: all made as the result of feedback from alert users of Premiere Pro everywhere. Thanks for the feedback. Keep it coming!" It's not exactly what you were thinking, but this posting over at LightroomNews has potential for courtroom displays. "Atlanta’s other reality show is taping today outside CNN Center, at Woodruff Park and in Midtown. What you might call Real Pedestrians of Atlanta is a rather modest video surveillance: a few dozen cameras monitoring select locations in the city every second. But the city has applied for millions in federal stimulus funds so it can train about 500 more cameras on city streets. The city may now engage in a debate that has roiled European capitals for years: Is closed-circuit surveillance a benign tool that helps the cops deter and even solve crimes, or is Big Brother coming to town to observe and record every move you make? City officials are seeking $13.7 million in federal cash amid a series of high-profile crimes in recent months: a champion boxer shot dead in the street, a City Council member carjacked at gunpoint, a rash of armed robberies near Georgia Tech. The system Atlanta plans to use could store images for up to 30 days and support software that reads license plate numbers and detects gunshots. Critics say the system conjures up images from George Orwell’s “1984,” a novel about a totalitarian state presided over by an all-seeing Big Brother. They wonder where the cameras will be pointed, who will have access to these images and sounds, how long will they be kept, and where will they be stored. ..."
In light of the Muni story, below, and the fact that they cite the need but haven't kept statistics on the effectiveness of their existing network, I wonder if they are just grabbing at stimulus dollars. 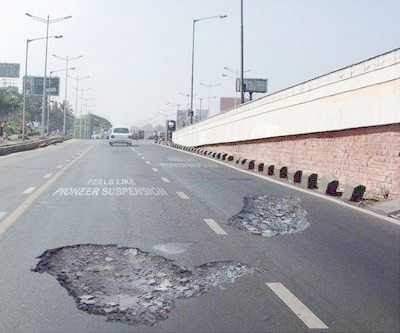 When the stimulus dries up, where will the maintenance money come from? It's also funny to read how they refer to Europe's schemes as justification ... without also saying that many in the UK and Europe are looking to back off CCTV because its true effectiveness can't be proven. Only time will tell. "The onboard video surveillance equipment on more than half of Muni's buses and trains was not fully operational when an emergency audit was ordered by the San Francisco transit agency after the stabbing of an 11-year-old boy on a city bus last month. The Chronicle obtained the results of the audit Monday through a public records request. The inspection's findings highlight for the first time the extent of the problem Muni has had in keeping a key component of its safety and security system in good working condition. The entire fleet, with the exception of the cable cars and historic streetcars, is outfitted with cameras. Of the approximately 960 vehicles equipped with surveillance devices, 22 percent were deemed completely nonfunctional and an additional 30 percent only partially functional, the inspection found. The remaining 48 percent worked. The audit found a range of problems: blurry images, vandalized cameras, poor sound, broken data packs, bad cables and inoperable recorders, among others. Since the audit was completed in late September, Muni has scrambled to fix the malfunctioning components - and has made progress, said Muni spokesman Judson True. ..."
A recent posting on the LEVA web site asks, "Accreditation or Certification – Which Do I Need?" as the lead in for a panel discussion at next month's conference. Webster's Dictionary defines "need" as 1. a necessary duty (obligation) 2. a lack of something requisite, desirable or useful." Which begs the question, is accreditation and certification necessary? Are they requisite, desirable, or useful? The question, as written, seems to presuppose an answer. Here's a better way of asking the question, "if a national body says that I need to be certified in order to do my job - the same job that I've been doing for the last 8+ years, then who's going to pay for the certification? Me? My agency? The national body? Or, will I just raise my rates and pass the cost on to my customers? This will be the case for privateers like me, but what about small municipalities? How are they going to afford to stay in business? Or here's another question, if I am operating as a sole-proprietorship, a lone analyst - will I "need" both a certification for me and accreditation for my lab to do the same work that I've been doing all along? Cui bono? My customers? How? As a "certifying body," LEVA (full disclosure - I'm a member of all of the groups mentioned in this post) naturally benefits from the potential increase in certification fees, class room fees, and the membership fees necessary to maintain the certifications. The same goes for other groups that certify - like NATIA, IAI, AFMA, and etc. They have a financial interest in the outcome. As such, their interests might not coincide with your interests. As they say in NY, "I know what you are thinkin', but I'm just sayin'." The same goes for accreditation - the groups that provide the service stand to benefit from a ruling that says "labs must be accredited." So, what side do you think that they will argue? My point is not to bang on these groups, only to point out that you - the individual - need to be aware of who's in the game, who's saying what to whom, and how it will/won't affect you and your work, your agency, and thus - your future. If you are going to LEVA, plan on attending the panel discussion - and don't be afraid to ask questions and raise your concerns. Your comments are always welcome here. Microsoft is out with Windows Mobile 6.5 and HTC, Samsung, and LG have picked up the OS for future versions of their phones. While it's not necessarily a big update, vs. 6.1, there are some improvements. But, the really big ones are being saved for version 7 - which is at least a year away. Click here for a comprehensive review. In other news, here's a comprehensive how-to on "rooting" an Android G1 phone. You'll want to know how to root the phone, in case you get a phone that's been rooted by the user. You'll need to know how to get around once inside, so that you don't turn the phone into an expensive hockey puck. Here's a couple of links to free monitor calibration utilities that I thought I'd share. Some folks are out there spending stimulus money on new equipment - buying the latest and greatest monitors to supplement their existing set-ups. They've spent it all ... and forgot to get something for calibration. Tom Neimann's (epaperpress.com) Monitor Calibration page. On the pay-to-play side, the Huey Pro from Pantone is an excellent choice - and inexpensive to boot. It works really well at calibrating different brands of monitors in a side-by-side multi-monitor set-up. 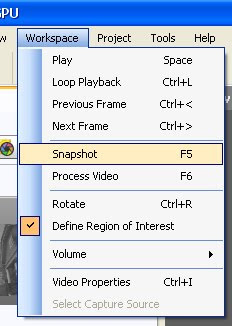 Those with 64-bit Windows systems often complain about not seeing thumbnail previews of PSDs and TIFFs. Thankfully, there's a utility that fixes the problem. From MysticCoder: "I use Photoshop and DDS textures extensively and couldn't believe thumbnail generation of major file types, particularly PSD and DDS, a Microsoft DirectX specific format, were not supported 'out of the box' in Vista (or anything else for that matter) and even more dejected when discovering x64 would not display thumbnails via existing x86 32 bit thumbnail generators due to the inherent incompatibility problems. Lets face it. How many people use Photoshop? Probably just about everyone. We need our thumbnails! How many game designers want to see their textures in Explorer? Yes, that's right. All of them. So, being a video game and graphics programmer I decided it needed to be fixed, and somebody had to take care of it fast. Properly. Once and for all. On all platforms. The solution needed to be made available to the masses that would be experiencing the same pain as I - for free. So I hope you enjoy being able to see your images, textures and other pictures that aren't supported by default." Good news and good news. Which do you want first? First, George Reis has a new blog over at Imaging Forensics. I'm glad that George has entered into the blogosphere. He's got tons of experience and knowledge in this area. Definitely check him out. He's said that he'll post weekly. With his busy life, that's quite the commitment. Second, courtesy of George, here's an insider's view of the certification process at the IAI. I like the way that they do things and have been a supporter of their efforts (as well as a member). I'm glad that George has opened up the process a bit. Transparency never hurts. "The good news: Crime scene video has become an essential aspect of the U.S. judicial system, opening up lots of employment opportunities for videographers nationwide. The bad news: The onus is on the videographer to shoot the evidence properly, using methods that do not distort, omit or sensationalize what happened at the crime scene. Henderson enters the Branch Davidian compound near Waco in 1993. In particular, the kind of attention-grabbing blood-and-guts shots that are sought after by news crews are shunned by crime scene videographers. The latter know that shooting footage that is too graphic for the jury to stomach, can result in the judge throwing out the video entirely. Gene Henderson is a veteran crime scene shooter, documenting crime scenes, incidents, and reenactments with photographs and video for the Texas Department of Public Safety since 1982. He’s taught crime scene and critical incident videography classes for the Law Enforcement and Emergency Services Video Association International (LEVA) throughout the United States and Canada for about 15 years." I get a ton of mail about configuring CS apps for use on older systems. Folks in public service often replace their systems every 3-5 years (vs. private firms that tend to upgrade every 18 months). If you are in public service, keep this announcement in mind when preparing your next purchase order. Future releases of After Effects and Premiere Pro* will only run on 64-bit systems. If you are spec'ing out new systems, 64-bit PCs running Win7 64 should work fine with Adobe's apps. Mac users already know that their systems will be fine. We were 64-bit before 64-bit was cool. *According to Adobe, Photoshop will still support both 32-bit and 64-bit systems. "Windows 7 is here ........ finally. For the most part Windows7 ( I suggest the 64 bit version) is working excellent with our CS4 apps. We will continue to monitor the various forums and see if any issues arise due to Win7. At this point, Encore CS4 has 3 known issues. The key issue involves the Roxio pxhelp driver that Windows 7 replaces (this may get fixed in a future Win7 update). The other 2 issues involve building and burning projects and having the computer go to sleep in the process. The fixes are easy ... "
Click here to read the rest of Dave's blog posting. 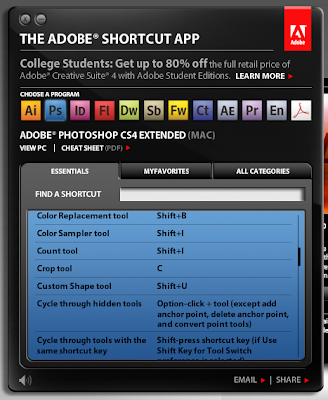 Having trouble remembering a keyboard shortcut in your favourite Adobe App? Now there's help. Meet the Adobe Shortcut App, powered by Air. Now you can find all of the shortcuts for your apps in one location. And ... it even links to a PDF cheat sheet, like this one for Photoshop CS4 Extended, that you can print out and take with you. How cool is that? "You what…?' are the last words the police want to hear over their radios when in hot pursuit with sirens blaring. The same goes in court if a jury can’t understand the recording of a critical 999 call made outside a noisy nightclub. In both cases, it would be tempting to reach for help from a speech-enhancement algorithm to separate the message from the medium. And yet research by the Centre for Law Enforcement Audio Research (CLEAR) has shown that most speech-enhancement techniques improve sound quality at the expense of intelligibility, particularly when the signal-to-noise ratio (SNR) is very low. Closely related as they are, speech quality and intelligibility are not identical. A great deal of the work on the intelligibility of speech has been done to improve the effectiveness of hearing aids and telecoms channels, where the SNR is typically better than 10 to 20dB. But in law-enforcement situations, the audio quality can be far worse, with SNRs of 0dB or lower quite common. And intelligibility is far more important than sound quality. If you cannot make out all the words in a recorded phone call or police interview tape, it loses its value as evidence. Similarly, those using communications equipment links in noisy environments, such as police drivers, put themselves and others at risk if they misunderstand what they are hearing or react slowly because they are trying to pick the signal out of the noise." An interesting series of posts appeared on Larry Daniel's blog regarding certification. "The problem with certifications and most licensing exams, as mentioned in the post, is that they have little to no correlation with real world work." As I was reading the post, I was thinking back to when I was training for an MCSE in the NT days. I remembered the first words spoken by the instructor, "This class focusses on giving you the knowledge and tools to pass the MCSE tests. Before you say it, I realise that much of what you will learn in this class is wrong, from an operational standpoint. With that in mind, absorb the materials for the test, then forget it all and stick with what you know works once you get back to your office." From my own experience, certifications tend to be a revenue addition for a particular vendor. They have little to do with proficiency. For some groups, maintaining your status as "certified" requires that you pay annual membership dues. Some focus on a single vendor's product line. For others, the certifications expire shortly after new versions of their app are released to the market. I am hoping that the trend will change soon. I've heard good rumours coming out of the IAI and the AFMA regarding vendor neutral certifications for video/image analysts. I wholeheartedly support these efforts. Lorex is a popular brand of DVR found at Costco and other big box stores, as well as on-line at stores like TigerDirect. For less than $500, consumers can purchase a 4 camera DVR complete with everything that they need to get into the wonderful world of CCTV. From the standpoint of price, I can see the allure of the Lorex brand. That's where the allure ends. Having spent the better part of an afternoon on-hold and then briefly talking with a Lorex tech-support employee, I found myself wondering if it would be more painful to place the business end of my screwdriver into my left eye, or spend more time dealing with Lorex. Every Lorex model is unique. Every Lorex model of DVR requires a unique player. Why? According to their tech-support employee, they change codecs and various other aspects of the internal recording mechanism (from DVR model to DVR model) depending on several variables which no one can seem to comprehend, much less me or their customers. So where are we? The model number doesn't exist in their system as printed on the unit and/or on the customer's invoice. The store at which the DVR was purchased shouldn't have had the type of unit described. To conclude this commentary, if all you want to do is view the cameras that you've installed in your place of business - not record the video or attempt to play it back after the fact, then a Lorex DVR should be fine. If you want to record what the cameras see and maybe even use the recordings for insurance or prosecution purposes ... then beware. Make sure that the model you are about to purchase is listed on Lorex's web site. Download all drivers and players immediately. Save your installation discs. Save your manuals. Ask your dealer if there is a demo model. See if you can make heads/tails of the controls. Ask your dealer to record something and then give it to you on CD - before you purchase the unit. Check the quality of the recording. So, if the model is listed on Lorex's site, and you have all players / codecs, and you understand how to operate the controls, and you've checked that the unit will record and export a usable file of reasonable quality - then purchasing a Lorex for $499 might make sense. My guess is that you won't be able to line up all of these things for any single Lorex unit below $500 - just my humble opinion. If you have to process files taken from a Lorex unit, be prepared to do a lot of work tracking down the appropriate player if one wasn't provided to you. In that case, let me know, I've now got at least 10 Lorex players that you can try. Lightroom 3 beta has been released to the public. Now I know that there are some folks in law enforcement that are using Lightroom for casework - some even using it in a "forensic" setting. Here's a subtle reminder to read the fine print - and avoid using a beta version for casework. "Like any beta, Lightroom 3 beta is unfinished, which means some of the features we have planned are not in this release, and some of the features in the beta are not yet complete." For photographers, there's a lot to be excited about - including portable sharable slideshows with audio and customizable print package creation. See for your self and don't forget to give Adobe some feedback. 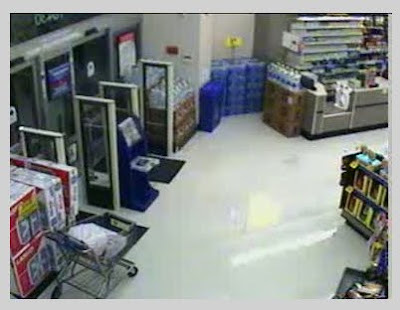 The FBI Forensic Audio, Video, and Image Analysis Unit (FAVIAU), with assistance from the FBI Training Division Distance Learning Technology Unit (DLTU) have developed a DVD Video containing the “Best Practices for the Installation of CCTV Recording Systems”. For “24” Television series fans this is a must watch! FBI Agent Renee Walker has lent her narration skills to our project. This twenty minute DVD Video is based on a realistic case scenario involving the do’s and don’ts of CCTV setup. The DVD contains exciting footage that will captivate its audience as well as explain the best practices and recommendations to provide personnel responsible for the installation and set up of CCTV systems guidance to obtain the best recorded footage possible. Topics include; general setup, resolution, cameras and camera placement, best collection methods of the recorded footage for Law Enforcement, native/proprietary file format, retrieval methods and much more. The goal is to encourage Law Enforcement to pass out this DVD to the intended target audience: people who own, operate, install or are responsible for the purchase of the CCTV recording systems. The DVD is expected to be ready for release January of 2010 and will be available free of charge to International, Federal, State, and local governments involved in law enforcement, security and counter-terrorism activities. Educators, contractors, vendors, suppliers and other interested parties will also be eligible to obtain the DVD free of charge. More information will be forth coming when the DVD is released. Stay tuned. We've all presented in front of an audience. For those that use PowerPoint or Keynote, we have that remote, hand held device that we waive around as we gesture. For our audience, it can be a bit distracting. Here's an interesting presentation aid that can help with that problem. If you are trying to demonstrate the functions of a DVR along with a slide based presentation, or have some piece of evidence in your hand, how are you going to advance the slides? The Bili Page/Score Turner allows you to advance the slides with your feet. It's a simple and inexpensive USB device that does one thing really well, advances or reverses slides / bullets on a presentation on any PC. They also carry a unique and affordable laptop stand. Even though I'm not using Lightroom for "forensics," it still is the weapon of choice in my home design/photography office. That being said, there are some helpful plug-ins available for Lightroom. The append feature is especially helpful. "'Append' adds extra text to the chosen field, either before or after. For example, imagine some images' captions are "Close-up of columns at Paestum" and others have "Overview of temple at Paestum", how do you add the text ", Campania, Italy" to all the images in one action? You would normally have to select each set at a time, so the Append command lets you add the text ", Campania, Italy" to all of them at the same time." LR/Transporter, from Photographer's Toolbox, is a Lightroom export plug-in that helps you to move your metadata in and out of Lightroom. "During an export LR/Transporter can generate a "companion" text file for each exported photo as well as an overall summary file. These files are built to your own specification from the metadata embedded in the photos." Jeffrey Friedl's Video Asset Management plug-in let you keep track of your video files from within Lightroom. Jeffrey Friedl also has this handy "Extract Cached Image Previews" plug-in that lets you extract JPG previews from the Lightroom database. This is the one that I warned you about. Lightroom is a database driven application. Preview images are retained within the database. This plug-in extracts previews, which can be extremely helpful if you've deleted the original and need something/anything restored - or extremely problematic if you have to turn over your catalog to the defense. 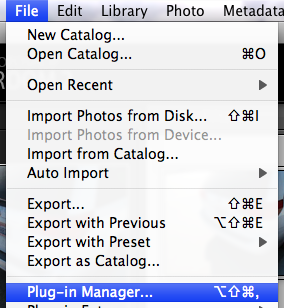 To load these plug-ins, use the Plug-In Manager found in the File menu. I came across an outstanding article full of useful tips for presenters in AV Technology Magazine's current issue. If you plan on using your own laptop, check with AV/IT staff to be sure they can support your brand/model computer. What type of video does the computer output, DVI or VGA? A DVI connection is found on some newer machines, but the predominant connection is still VGA. If you have a DVI connection, confirm that the projector has inputs for DVI. If not, you will need a DVI-VGA converter. You’ll also need to understand how to output video from your computer. Most PCs have a key combination that tells the computer to output the video (instead of only on the internal screen). Typically, these keys include the “function” (Fn) button along with an F key. For example, on a Dell laptop, you press Fn+F8 to output to a projector. It’s your responsibility to know how to do this on your computer. either a mini-VGA or a mini-DVI cable to output the video. You need to know if your computer uses one of these cables. If so, it is your responsibility to bring one along with you. You should not assume that other facilities have the type of cable you need. I got these shots in the mail. I though that they were interesting enough to post. I'm not sure how to properly source them, but I think that you'll enjoy them just the same. "Speed controls being used in Eastern Canada. How's this for excellent speed control?" "I don't know about you, but this would slow me down ! 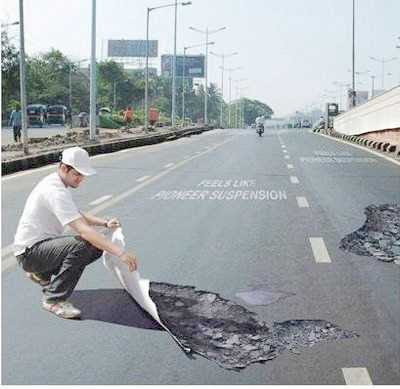 People slow down and try to "straddle" the hole ..... "
"This is actually a speed control device that is in use. 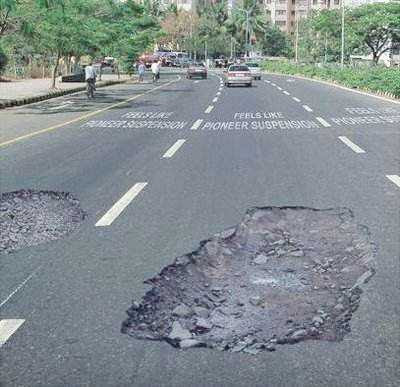 It is much cheaper than speed cameras." "Pretty clever - especially when moved around each day. Isn't art wonderful?" Keep the comments and funny pictures coming. "Cellphone service provider T-Mobile is owning up to what could be one of the biggest cloud-computing disasters so far. T-Mobile and the Sidekick data services provider, Danger, a subsidiary of Microsoft, are reaching out to express our apologies regarding the recent Sidekick data service disruption. We appreciate your patience as Microsoft/Danger continues to work on maintaining platform stability, and restoring all services for our Sidekick customers. Regrettably, based on Microsoft/Danger’s latest recovery assessment of their systems, we must now inform you that personal information stored on your device - such as contacts, calendar entries, to-do lists or photos - that is no longer on your Sidekick almost certainly has been lost as a result of a server failure at Microsoft/Danger. That said, our teams continue to work around-the-clock in hopes of discovering some way to recover this information. However, the likelihood of a successful outcome is extremely low." Read the rest of the story by clicking here. There's additional news and a ray of hope in this posting. Hopefully, you've received all of your requested info from Microsoft before the crash. If not, it could make putting together your case based on recovered info from a Sidekick a whole lot harder. You know that I like Alien Skin's Blow-Up 2. They're out with an new update - and it's free to registered users. The update features a new panel for CS4 that makes using the plug-in so much easier. You can also run Blow-Up 2.0.3 from the Filter menu (it used to be found in the Automate menu). If you don't already own this inexpensive plug-in, there's great news. Everything in the Alien Skin store is 20% off, but just until October 21st. In other news, Jeff Butterworth, Alien Skin's CEO, snuck an Easter egg into Snap Art 2 when no one was looking. If you enter 111 into the Random Seed for the Stylize filter then it will render something out of the ordinary. He’ll give you a concrete reward for finding the Easter egg. Do you know the mathematician who discovered that beautiful shape? You can use his first name (without accents) as a coupon code in their online store to get 25% off. Consider this the math nerd version of the sale, both of which end on October 21st. On balance, there was a lot to like about Ikena. It's easy to learn, easy to use, and if you have some decent video to start with ... it produces some decent results. 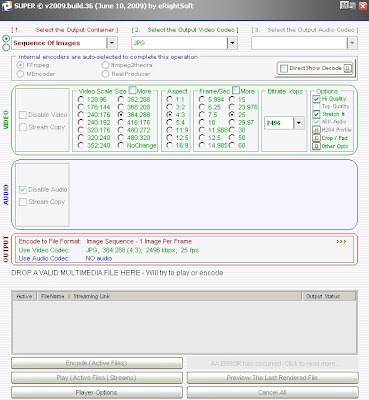 It has the basics covered, basic colour and light controls, cropping, still image export, and it even allows you to export your finished product as an uncompressed AVI file. There's also a lot to Ikena that I didn't like. For the price, I would have liked a built-in screen capture utility. I would have liked the aspect ratio issue fixed before releasing it to the "forensic community" at full price. I certainly would have liked better documentation - though their staff made every effort to answer my questions honestly and thoroughly. I'm one of those people that likes to get my hands on the manual and actually read it. We're a small community of users. I understand this completely. It's tough to make enough profit on a product in this market to justify the development expenses. At the same time, we don't want to be treated as a vertical marketing opportunity for an existing product - at least without making that product suit our needs. We want what we want for specific reasons, reasons that you'll find throughout this blog. If we see a product that doesn't deliver what we want, then we wait. Unfortunately for MotionDSP, there's nothing in Ikena that makes me want to spend over $7k of my hard earned (and deflating) dollars right now. And ... if I won't spend my own money on a product, I'm sure not going to recommend that my friends do anything different. So, overall I feel the same way about Ikena as I did about ClearID - or other 1st versions of software for the "forensic" marketplace. It's a good first step. I'm hoping that they'll take my review, and the reviews of others in the field and strengthen their product for the next release. I was having a discussion recently about cropping. It was triggered by Katrin Eismann's article in Photoshop User about framing the scene and reasons to crop. She mentioned that one of the reasons one might choose to crop a photo was to "[d]elete or hide unimportant image information." Another reason might be to re-compose, focussing on essential content. The danger for us is that the decision to delete info or to re-compose requires a judgement call that will have to be explained later. In a previous post, I outlined how to crop non-destructively. Katrin also notes the potential for destruction and offers her take on non-destructive cropping. In the new world of Melendez-Diaz, documentation is key. If you choose to crop an image, make sure that you document not only what you did and how you did it, but why you chose what you chose to remain. The defense may want to know why, and you should have a very good reason - one that's easy for the jury to understand. At a recent trade show, I was talking with an enthusiast about noise levels in night photography. We were talking about various ways to mitigate noise, and the conversation invariably turned to Frame (image) Averaging. I remembered seeing an outstanding article on the subject, but for the life of me, couldn't remember where. So, with apologies for the delay, here's the link to the article by Sean McHugh at Cambridge in Colour. Whilst you are there, cruise his galleries - the images are gorgeous. With the media's focus on the news of Jaycee Dugard's return, several readers wanted to know a little more about the process. Rather than re-invent the wheel, here's a tutorial on using Photoshop for Age Progression from exguides.org. Concerning the FTC's endorsement ruling. Great news, if you receive a free copy of the latest video game and post a positive review of that game on your personal blog without revealing that you got the game free of charge, you could be guilty of ad fraud, according to new guidelines from the Federal Trade Commission. While the FTC is simply trying to protect the consumer (I suppose), not everyone is happy about it. Click here, here, and here. Sometimes, I get stuff sent to me for review without asking. If it's useful, I ask the vendor if I may continue to use it. Sometimes, they say yes, sometimes they ask for a reduced fee, and sometimes they ask for the full retail price. Other times, I pay full price for an item, then decide to review it. Once in a while, I pass along links to interesting items that I haven't seen. But, now ... I'll have to give a disclaimer for each review or get fined. Ouch. A reader writes in to ask, what's confirmation bias and what does it have to do with processing video evidence? In our work, confirmation bias can corrupt results. It's supposed existence in forensic science is part of the reason why the NAS Report suggests separating labs from police facilities - implying that an LE officer who is also a forensic scientist would "work" the evidence towards a pre-determined conclusion instead of just processing the evidence and letting it stand as is.